This day, Christmas Eve 2012, marks the 99th anniversary of the sad and tragic events at Italian Hall in Calumet, Michigan. 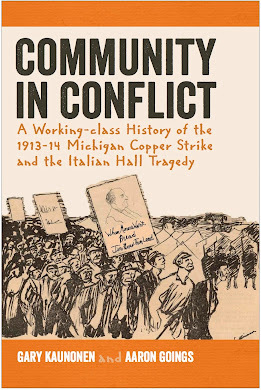 The events of Italian Hall turned the Copper Country on its head, and a bitter 5-month strike dividing workers and companies, friends and neighbors, and in some instances family member from family member became even more acrimonious. People associated with the Western Federation of Miners union blamed a vigilante group, the Citizens' Alliance for orchestrating the events. The most appalling disaster in the history of Michigan occurred last evening at the Italian Hall in Calumet where hundreds of men, women and children had gathered to witness Christmas exercises for the strikers[’] children. The program which was quite lengthy had just begun when a strange man ascended the stairway, yelled “fire” and quickly made his escape to the street. Several persons who stood near the entrance where this man appeared, state that he had his cap pulled down over his eyes, and that pinned to the lapel of his coat was a Citizen’s [sic] Alliance button. At the cry of fire the great crowd arose as one and made a mad rush for the exit in the front of the building. In the rush down the stairway many fell and being unable to regain their feet were trampled to death, their bodies acting as stumbling blocks for others who followed, until the hallway was entirely blocked by the dead and dying. The fire alarm was soon sounded and those responding were forced to gain entrance to the hall by ladders at the front windows. Firemen entered the building in this manner and stopped the panic stricken crowd from further crowding into the hallway upon the dead bodies of their friends in a frantic effort to escape. The bodies in the hallway were so tightly packed that they could not be released from below, and firemen were compelled to remove the dead from the top of the stairway carrying the dead and dying back up into the hall before the stairs could be cleared. At the time the cry of fire was sounded in the hall Mrs. Annie Clemenc was making a talk to the little ones present who naturally were crowded as near the stage as possible, their little faces beaming with happiness, their hearts bounding with Christmas cheer. In less than three minutes afterward fifty of their frail little bodies were jammed and crushed in the hallway being used as a roadway over which their companions were vainly endeavoring to escape. The scene was a horrible one, and will never be effaced from the minds of those who witnessed the terrible tragedy. The bodies of the dead were taken to a temporary morgue established in the town hall as soon as they were removed from the building. As soon as identifications were made, the bodies were removed to their homes. In some homes the mother and all the children lie cold in death, the husband and father crazed with grief. In others the mother being the only one spared has been plunged into despair and sorrow that yet dazes her, the full truth not yet dawning upon her terrified brain. An estimated 73-79 people died in this horrific event. Close to 60 of these deaths were children. A terrible and tragic event, Italian Hall should be remembered for several reasons. Primarily because we should always honor the memory of those who died in the hall. Mostly children, the lives of those who passed at Italian Hall were filled with so much potential. Additionally, these were working class folks who died at Italian Hall, and often "history" at the very least forgets, or in worst cases, is negligent of the struggles and tribulations of those in the working class. Most traditional histories champion the memories of the presidents and industrialists who supposedly gave so much, while overlooking the people who did the actual work in building America--the WORKing class. Remembering those who died at Italian Hall gives their lives as working class members involved in a hotly contested labor strike the due diligence that most textbook histories dismiss. Finally, as the great folk singer Utah Phillips notes, one of the most important gifts to America's working class is "the Long Memory." Referring to "Long Memory" as the most radical idea in America, Phillips opines in his spoken-word song "The Long Memory," that those of us coming up today battling many of the same injustices in the wage-slave system, can only begin to understand OUR exploitation and attempt to control the conditions of OUR labor by understanding OUR collective past as a united working class. So, where does this knowledge come from? According to Phillips, it is OUR elders. Those elders who sat-in, spoke-up, and sometimes tuned-out, have a wealth of knowledge that can never be learned from a text book. Those working class elders who marched in strike parades, nearly froze to death in picket lines, and sacrificed their lives for something as simple as a Christmas Eve party in Italian Hall have demonstrated to all of us how important, essential, and vital something as simple as collective action can be. That lesson is not inherent, it is learned and earned from each battle on the picket line, each fight for free speech, and every tragic loss to senseless labor violence directed at workers trying to assert their rights to organize in a collective body. The "Long Memory" allows us today to carry the lessons of the past into the future and gain the wisdom of those who have fought the good fight before us. Simply, the "Long Memory" allows us to never forget the past, while always moving forward.